Saul and his family arrive at Gods Lake in the late summer. Gods Lake is a beautiful, round lake, with fresh air and tall trees in all directions. They pitch tents and fish from the waters. Everything seems to be perfect. Even Benjamin seems to be getting better. The chapter begins on a happy note, with the family flourishing and enjoying its time in Gods Lake. One afternoon, Saul is walking by himself along Gods Lake when he hears the sound of his own name. He’s astounded to see a group of men and women sitting by the lake. The women laugh, and children play in the water. Some of the elders of the community nod at Saul. Then, suddenly, night falls over Gods Lake. The irregular passage of time and abrupt appearance of the men and women (when, supposedly, nobody else is allowed by Gods Lake) suggest that this is a dream or vision, of the kind Saul described in the first chapter. Suddenly, Saul feels a great hunger. In the distance, he can hear drums and the sound of dancing. Then, just as abruptly, Saul realizes that it’s the dead of night—all is still. In the distance, Saul notices a man singing. The man finishes his song and then bows his head. A moment later, a wolf calls out. Saul’s vision encapsulates many important aspects of Fish Clan culture, from dance and song to the tribe’s harmonious relationship with the natural world. In short, the vision marks Saul’s introduction to the totality of Fish Clan tradition, presented here as a living, breathing thing, rather than an abstract concept or a metaphor. Suddenly, it is morning. Saul hears the sound of falling rocks. To his horror, he sees that the community of people living by the lake has disappeared, crushed beneath heavy boulders. Saul hears his name again, and he turns to find Naomi staring at him. Saul begins to weep. Saul’s vision ends on a tragic note, with the destruction of his ancestors by a landslide. The scene suggests that tragic destruction is a pattern in the history of Saul’s clan, played out repeatedly through the generations. At the time when this vision takes place, the Indigenous population of Canada has already been ravaged by disease and genocide, and is now undergoing cultural genocide—or the systematic destruction of their land, traditions, and values. Arn, Jackson. "Indian Horse Chapter 6." LitCharts. LitCharts LLC, 6 Sep 2017. Web. 24 Apr 2019. Arn, Jackson. "Indian Horse Chapter 6." LitCharts LLC, September 6, 2017. 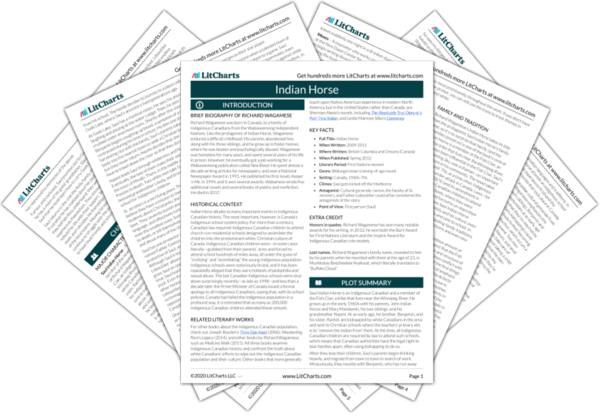 Retrieved April 24, 2019. https://www.litcharts.com/lit/indian-horse/chapter-6.